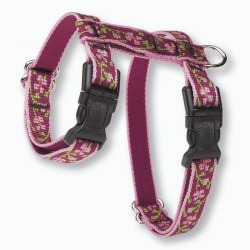 Just right for smaller breeds, this collar has a slightly oversized side-release clasp for easier fastening and unfastening-a feature greatly appreciated by many customers. Available in sizes: 6"-9", 8"-12" and 10"-16"
Features a 6" hand loop and 2" trigger style snap. Available in: 4' and 6' lengths. 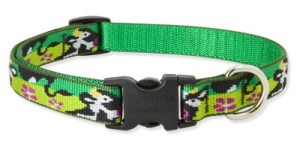 Adjustable from 8"-12", this collar features a breakaway buckle and is available with or without a bell. 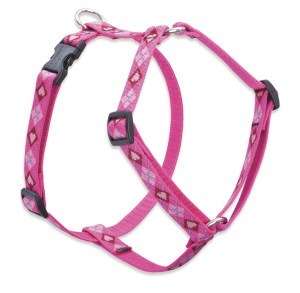 Please Note: This collar is not designed for walking your cat on a leash. 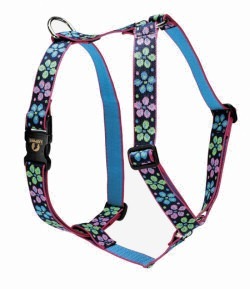 See the H-Style harness, below, for walking your cat on lead. 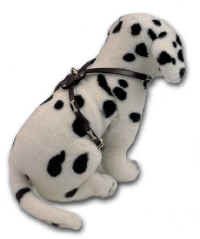 A true non-restrictive harness, ideal for small, fragile dogs. Adjustable shoulder straps help to reduce strain on the neck and back. Available in girth size ranges: 9"-14" and 12"-20". A very secure harness for walking small pets. An adjustable collar buckles around the neck and is joined to an adjustable girth. Available in girth size ranges: 9"-14" and 12"-20"
To find the the best size range for your pet, measure around the ribcage, just behind the front legs, then add 5-10% extra for comfort. Fully adjustable, with welded steel D-ring and heavy duty side release clasp. Available in size ranges: 9"-13", 12"-20" and 15"-25". The top rated feature by consumers, our padded handle is comfortable in the hand, even with hard pullers. Features convenient gate-style snap. Available in 4' and 6' lengths. 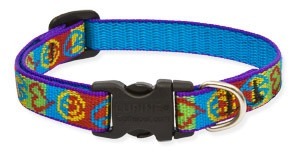 3/4 Combo Collar -A wonderful dual-action collar for walking or training and the only design for greyhounds and similar dogs that back out of regular collars. 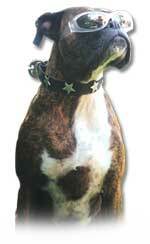 Rated the Top Pick by a national canine publication. 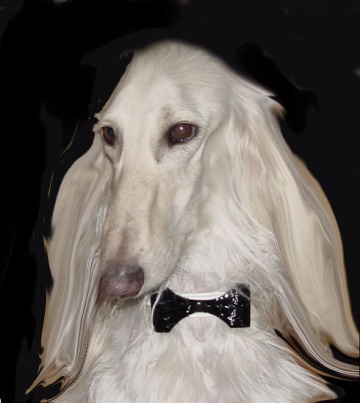 Martingale-style with an additional sewn-in D-ring so it can be used either as a limited-slip choker or as a regular flat collar. With adjustable shoulder straps and an extra long sternum strap to fit a wide range of body types. Welded steel D- and O-rings and a heavy duty side-release clasp on the adjustable girth. Available in girth size ranges: 12"-20", 14"-24" and 20"-32". Fully adjustable, with a welded steel D-ring and heavy duty side release clasp. 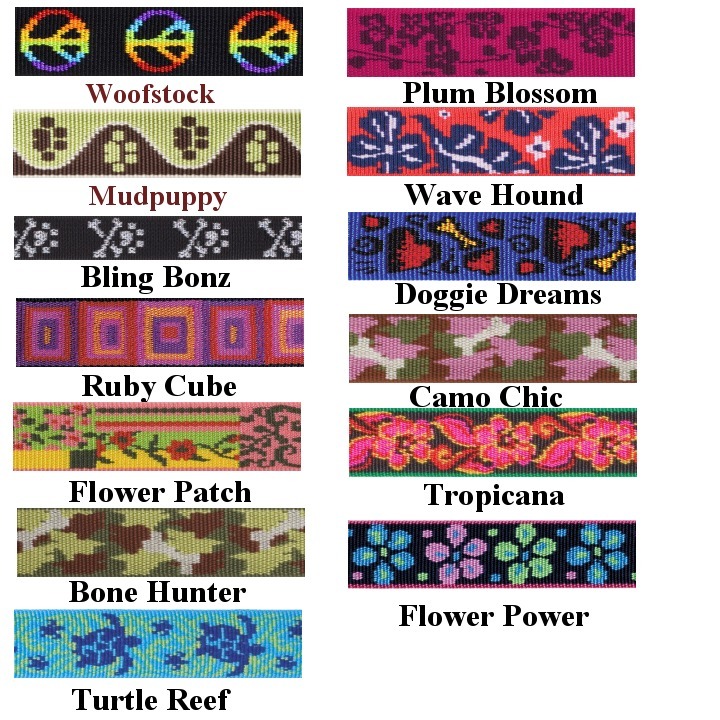 Available in size ranges: 12"-20", 15"-25" and 18"-31"
1" Combo Collar A wonderful dual-action collar for walking or training and the only design for greyhounds and similar dogs that back out of regular collars. Rated the Top Pick by a national canine publication. Martingale-style with an additional sewn-in D-ring so it can be used either as a limited-slip choker or as a regular flat collar. With adjustable shoulder straps and an extra long sternum strap to fit a wide range of body types. Welded steel D- and O-rings and a heavy duty side-release clasp on the adjustable girth. Available in girth size ranges: 20"-32", 24"-38" and 26"-44"
Available in all sizes. Leash is 3/4" by 5". 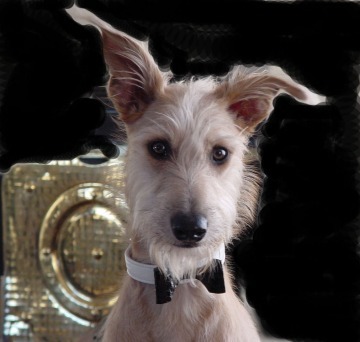 Please specify collar size at check out. 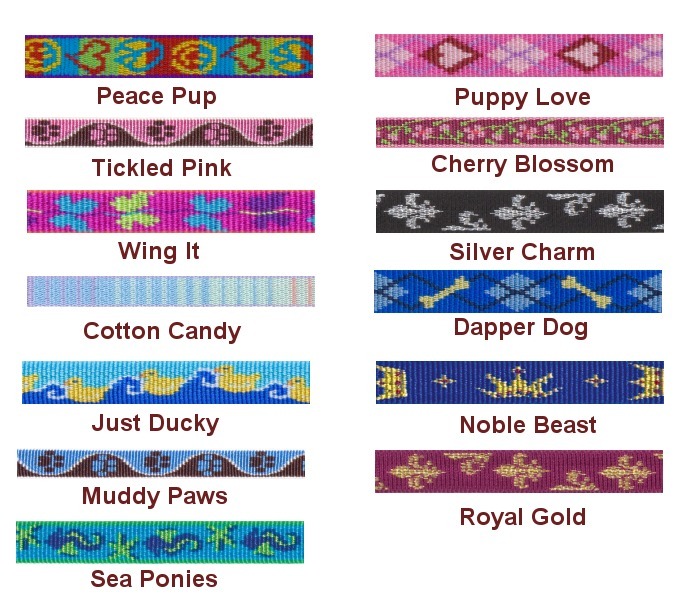 This line elevates your pets self esteem by displaying his sense of fashion. With all the colors of harness leather and the multitude of decorations available to mix and match, your pet can show off his style. Benny and his Boxer girlfriend Rosie Nonodropthat are happy to test the products during daily Boxer wrestling sessions to assure you that the products will hold up under most conditions. Full guarantee just in case they missed anything. 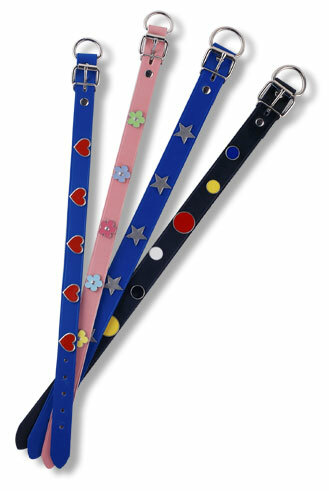 Dog Collars-Nickel only are available in these sizes: 1/2" x 12" -16", 3/4" x 16" - 22", 1" x 18" - 26", 1 1/4" x 22" - 28" in the following decorations : Silver Daisies, Spring Daisies, Bones, Hearts, Stars, Paws, Polka Dogs. Please specify ornament choice upon checkout. 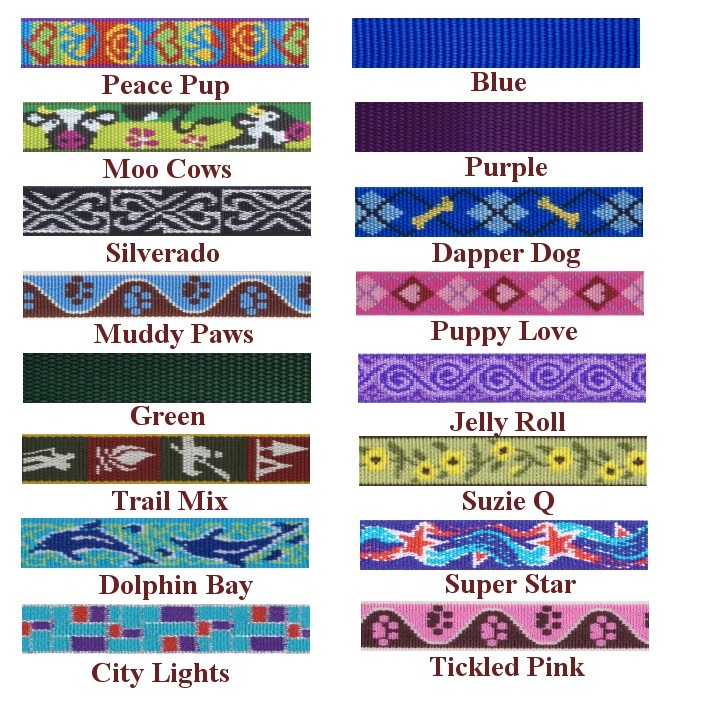 Colors available: Black, Brown, Camel, Red, Purple, Green, with Nickel buckles only. 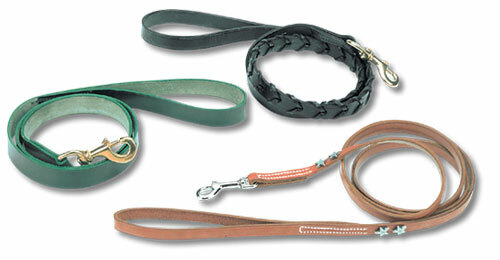 Leads can be matched with above collars in 3 widths and 2 lengths: �, � and 1 in 48 and 72. Nickel only.